Welcome kids to the classroom with this lively call-and-response French children’s song that teaches the French words for greetings and weather. Children learn the French words for sunny, rainy, cold, and hot as they sing along. No matter what the weather, they are always très bien! Si aujourd’hui il fait beau. Si aujourd’hui il fait beau. Comment ça va ? Très bien ! Et si aujourd’hui il pleut . . . Si aujourd’hui il fait froid . . . Si aujourd’hui il fait chaud, comment ça va ? Très bien! The song is from Whistlefritz’s CD ALLONS DANSER! Song “BONJOUR LES AMIS” from the Whistlefritz CD ALLONS DANSER! Comment ça va ? Très bien ! Ça va toujours bien ! It’s raining. It’s pouring. Why stay inside when it’s much more fun playing in the rain? 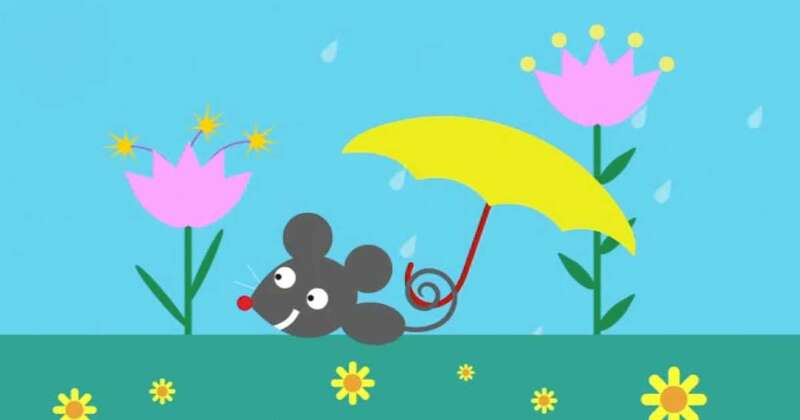 This video clip from the Whistlefritz French immersion video, LES SAISONS, shows kids having a ball dancing, twirling umbrellas, jumping in puddles, splashing, and playing to “IL PLEUT,” a French song about rain. Song “IL PLEUT” from the Whistlefritz CD ALLONS DANSER! Video from the Whistlefritz video LES SAISONS. La pluie tombe du ciel. Les gros nuages sont gris. On danse sous la pluie. It’s raining. It’s pouring! How is everyone in the family reacting to the prospect of rain? French singer and composer, Emilie Moskal, has taken the first verse of this traditional French children’s song and created an entirely new, whimsical, and funny narrative detailing how the different members of the family vary in their reactions to the rain. The song is from Whistlefritz’s CD CHA, CHA, CHA — French Learning Songs. Song “UNO, DOS Y TRES” from the CD CHA, CHA, CHA. Traditional music and first verse. Additional verses and lyrics by Emilie Moskal. Chanson (premier couplet) et musique traditionnelles. Couplets additionnels et paroles d’Emilie Moskal. Arrangements de Didier Prossaird. Et pêche du poisson pour toute la maison. Elle danse sous la pluie. Elle fait de la poésie.